Can LAFC learn from the Vegas Golden Knights? By Luis Bueno – RIVERSIDE, CA (May 23, 2018) US Soccer Players - The new team that arrived with great fanfare this season, taking everyone by storm and captivating viewers across the USA and Canada as it nears a championship wears black and gold. This team is not Major League Soccer’s Los Angeles Football Club but rather the National Hockey League’s Vegas Golden Knights. The expansion team had an amazing season and has now reached the Stanley Cup final. They're now four wins away from what would be an improbable championship. While the NHL and MLS are different entities entirely, there may be a parallel between the Golden Knights and LAFC that extends beyond their similar colors. Glory is not out of the question for expansion teams. If the Golden Knights can overcome greater obstacles than the ones that face LAFC to reach their league’s championship round, then perhaps LAFC can fancy itself an MLS Cup finalist as well. History suggests that LAFC will not get close to the MLS Cup final. No expansion team since 1998 has won the MLS Cup final, and that was in a vastly different era. No expansion team has reached MLS Cup in its first season and worse, expansion teams traditionally have struggled to make any noise in the MLS Cup playoffs at all. The Golden Knights’ run shows that a team can overcome expansion history. No NHL expansion team had reached the playoffs since 1980. Vegas not only made the playoffs, they won their division and finished 2nd in the Western Conference. They also set a record for most points by an expansion team, finishing the year with 109 points. It's probably harder for the Golden Knights than it would be for LAFC. Perhaps until the Golden Knights’ success story, the thought of LAFC winning MLS Cup seemed like a far-fetched idea. Every team sets out at the beginning of the season to win enough games to get into the playoffs; win playoff series to advance to the final; win the final. It may not be realistic for many teams, but that's still the goal. For LAFC, that seemed more like a dream before the year started simply because of history. Now, there has been an expansion team to win MLS Cup. The Chicago Fire lifted the MLS Cup trophy in 1998 in its first year of existence. Bob Bradley coached that team then and LAFC now, but it's tough to make direct comparisons. Chicago and Miami joined MLS in 1998 and Chivas USA and Real Salt Lake joined in 2005. The most recent expansion phase that began with Toronto FC in 2007 is more of a parallel than what may as well be the league’s ancient days. Of the nine teams that have come in from 2007 on, three of them have won an MLS Cup. Portland won the league in 2015 in its fifth year of existence. Seattle won the year after that and Toronto claimed league glory a year ago. Only Seattle has had consistent success since joining the league. In fact, of the teams that joined MLS in 2007 and after, only those three have reached MLS Cup. Philadelphia, Montreal, Orlando, NYCFC, and Vancouver have struggled collectively to make the playoffs, with a combined 11 postseason appearances in 27 combined seasons. Atlanta made the playoffs a year ago while Minnesota did not. Perhaps Atlanta and NYCFC a couple years prior have ushered in the fourth expansion era. Those teams have not been afraid to spend on incoming players. Atlanta paid $15 million to get Ezequiel Barco from Independiente of Argentina. Those teams are spending serious money on transfer fees and salaries and that’s given teams like LAFC an edge. LAFC is spending $6.2 million on Carlos Vela and Diego Rossi is making $1 million. Adame Diomande is at $934,000. LAFC also gathered high-salaried MLS vets in Laurent Ciman ($660,000), Benny Feilhaber ($625,000), and Lee Nguyen ($500,000) for its first-year roster. Money matters. It always has and always will. Money certainly played a role in getting LAFC here, from the deep-pocketed owners being able to afford an MLS franchise to constructing a stadium and dropping cash on player salaries. However, t’s not just throwing money at a project that makes it go. The coaching has to be right, the philosophy has to be strong, and the team needs to set a solid foundation and go from there. That’s the part that is tough in soccer, building off of a foundation where none has existed. LAFC is creating that foundation even though the club had followed a formula that led to disaster for many previous teams in the same situation. They started off on the road while construction finished on their home stadium. LAFC meandered through that well enough. The club carried a 4-2-0 record into its first home game. Only Atlanta is able to match LAFC’s four road victories. Most teams in the league struggle to compete on the road. 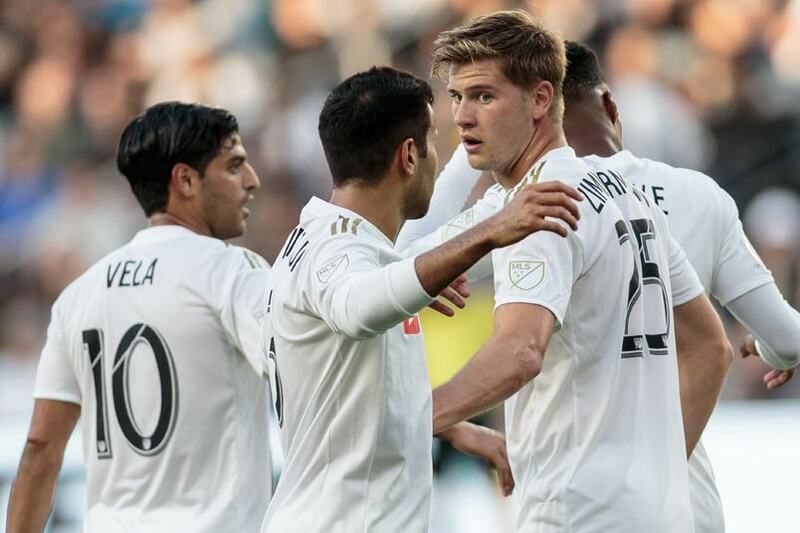 LAFC has as many road wins as the bottom five teams in the Western Conference combined. That foundation appears solid. In its short existence, LAFC has had high times and low times, important and gritty wins, disastrous and embarrassing losses, and a smattering of everything in between. It's not getting any easier. The summer could rob LAFC of potential World Cup-bound players Carlos Vela (Mexico), Steven Beitashour (Iran), Marco Urena (Costa Rica), and Omar Gaber (Egypt). Then will come the late summer/early fall stretch to nab a playoff spot and then the postseason itself. Even though some of the players have experienced that already in MLS, collectively all of that will be new to LAFC. That is the stretch that has claimed newer teams before. Atlanta crashed out early in the playoffs last year. NYCFC has not been able to get past the conference semifinals in their second or third year of their existence. LAFC only needs to look 270-miles northeast to see that history should not stand in the way of anything. It is way too early to fit any MLS team for a crown. That said, LAFC is and will be a contender come November no matter what history says.